So here's how things are going to work for the Steam sales. After the break I'm going to go over what's really great (and the reason for it), what you might like (if you're a fan of the genre), what isn't much fun (and why) and what games I have no sweet clue about. Then at the very bottom I'll post a quick guide to the achievements of the day, or at least the ones I can achieve myself. If I play my cards right, I might even have videos. Well, not on today's post, but hopefully tomorrow. That's right, I'm bringing in the big guns. Metro 2033 is probably more of a "maybe great" recommendation because it's a game that asks a lot of the player. It's very weirdly niche and flawed, but it's one of the most immersive living worlds in a FPS since Half Life 2. In fact, Half Life 2 makes a great comparison; Metro 2033 is chock full of the dense background NPCs and in control story moments you had in Valve's seminal release. 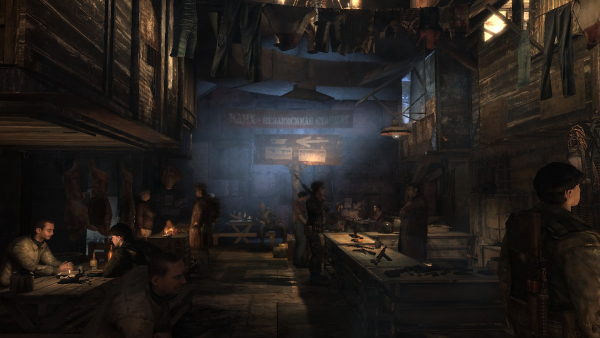 Walking through the camps of the metro system there are dozens of NPCs, each with their own quirks and behaviours, creating the impression of a tightly packed city that feels far more realistic then what you get in the average apocalypse FPS like Borderlands or Rage. The action scenes mix between amazing and frustrating; realism is used almost to a fault. For example, travelling on the surface of post nuclear Russia requires a gas mask, and you need to change the filter every so often. Your filters are limited, and changing each one takes time that you can't really spare in a fire fight. The timer for these filters isn't onscreen, but on your wristwatch you check with the T key; UI is truly minimized as much as possible. Lights need to be cranked, weapons jam and minecarts are going to have to be hand pushed. The enemies are bullet sponges that require far too much ammo to kill, made worse by the fact that ammo is a) very limited and b) currency in the shops of the metro network. But for sheer atmosphere and immersion, Metro 2033 makes for a brilliant, but flawed, experience. Max Payne shows its age a lot these days; in fact, the audio won't even work in Windows Vista/7 in the first game without a huge fan patch fix. The graphics are chunky and old, Max constantly has the famed gotta-poop face, and there are some obnoxiously unbalanced levels in the mix. But the game is still incredible, and is one of the better third person shooters of the previous gen. Max Payne is essentially a game form of the heroic bloodshed wuxia films of Hong Kong, mixed with noir storytelling and Norse mythological overtones. The story was presented in short graphic novel scenes before it was done to death in the last few years, and is pretty interesting to boot. The bullet-time system and ability to dive around corners keeps the gunplay very hectic and fun, and there are lots of levels that attempt to switch up the formula; some great, like a chase scene over rooftops, and some lame, like moments when your weapons are stolen and you have to "stealth" your way through. But the games overall are excellent (and very moddable, with some incredible community efforts) and seriously worth your time for only $3.75. There's been a sudden boom in third person action tower defences, which seems like an oddly niche genre. 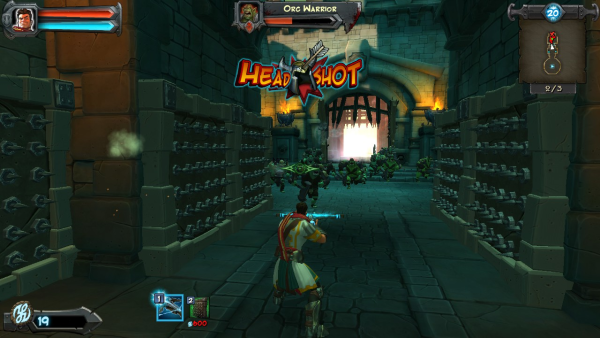 But Orcs Must Die, released shortly before Dungeon Defenders and long after original indie example Sanctum, is probably the best of the bunch. It is not without flaws; for example, the game doesn't take itself very seriously, with lots of eye rolling pop culture references and silly humour. There's not a lot of depth, with no class system, a linear series of unlocks and only one upgrade per item. It's not ridiculously lengthy, and there's no multiplayer at all beyond comparing high scores. But it is very very fun. The trap system is far more interesting than the average tower defence, with the ability to set off combos (example: a spring that bounces orcs into a pit of spikes that poisons and slows them allowing easy headshots from your crossbow). It doesn't suffer from the coop requirement and grind of Dungeon Defenders, and the production values are way higher than Sanctum. Sometime the jokes are even funny enough for a chuckle. In the end, the first effort from the former Age of Empires developers Robot Entertainment is a fun shorter title that's definitely worth the time to play it. Also, I think the metal+harpsichord soundtrack is all sorts of awesome. I don't even like metal, but nothing compliments a squealing guitar like a harpsichord. It's Portal. I can complain all day that the second game devolved into a linear, easy, I Spy retread, but it was damn well written, and damn funny. Wheatley is one of the better characters to come out of this current gen of games, and anyone who says otherwise is a monster who hates science. Not much more to say besides that if you haven't played it, you could do a lot worse for seven point five bucks. And if you haven't played then first Portal then congrats on buying a computer for the first time. You'll love it. Ha, but seriously folks, it's been free for what seems like every two weeks for the last year. This game can only be described as pants-shittingly scary. It's scary in the way no other game has scared me before. I can't play it without a stiff drink of liquid courage first, and even then there is much weeping, usually openly. Of course, it gets a whole lot less scary the first time you die, because then you start to realize that it is just a game with clearly defined parameters. But before that I literally felt like if a monster got me I would die in real life. 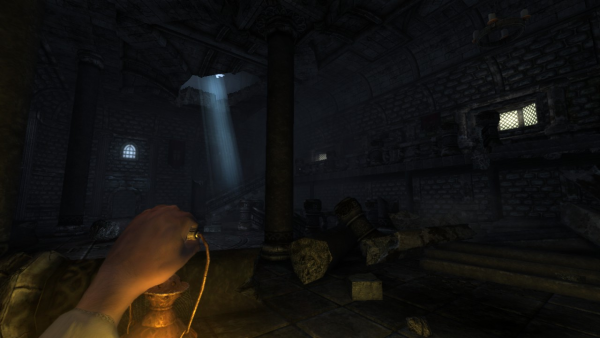 Even beyond the horror, it's very well designed and captivating, and Frictional Games deserves all the praise they've received. A must purchase if you don't mind scary moments, a definite skip if you do. I love the concept of Telltale's release system, and I quite enjoyed the little bit I played of Back to the Future and Tales of Monkey Island (though the controls drive me nuts). I'm just not a huge fan of the Lucasarts inspired point and clicks; I find the puzzles are sometimes so outside the box it's frustrating to continue, despite the excellent writing. That being said, every Sam and Max game (except, obviously, the original) for twelve bucks is a pretty gosh darn good deal, and my friends who love point and clicks adore this series. It's funny, well written, there's a lot of contiunity and shoutouts between the seasons (and the original Lucasarts release) and, for those who base their purchases on meatiness, there's a lot of content in the pack (each episode lasts a couple of hours, and there are now fifteen of them). A pretty obvious purchase for a point and click fan. The ultimate definition of a flawed but great game. The first game is ridiculously grindy and repetitive, and the second one is open to a fault and not very stable. That being said, these games are near perfect free roaming sandboxes, and the adventures between missions become far more enjoyable than the missions themselves. Even better in the second game is the destruction engine; things splode real nice. You can almost skip the missions and story, and still be presented with a playground of destruction that seems designed to create those "oh sh-" water cooler moments. If you're curious you should give the demo a shot, the main game is more of the same without a time limit. I know, that guy looks awesome. But the Fable series has never done it for me. The first one was fairly ok back when I played it for Xbox, the second just kind of bored me and I didn't play the third. General friend reaction seemed to be that Fable III wasn't all that hot anyway, and was basically more of Fable 2 but with new issues and annoyances. In fairness, I have been told the PC version is an excellent port. 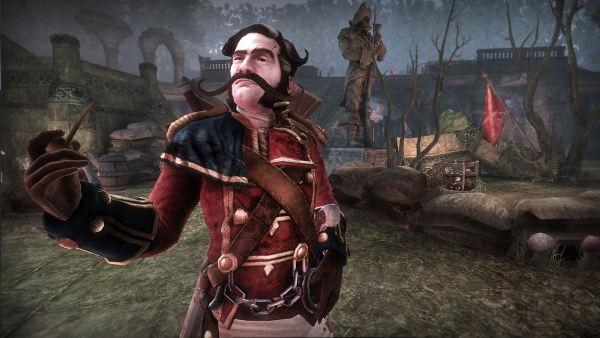 In other news, Fable: The Lost Chapters was added to Steam and discounted as well. If you're torn between the two, I'd go with Lost Chapters. 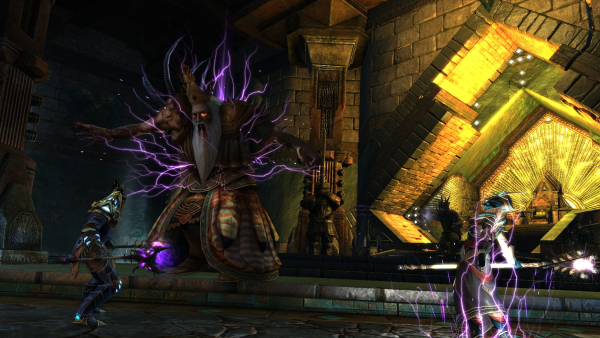 It's not a perfect RPG, but it's worth a look if you're dying for a new freeform RPG. While I wouldn't completely discount the genre, I have more than enough FPS games to play without adding this one to the list. Medicore reviews, a less than impressive demo (which is console only unfortunately) and another time mechanic that doesn't get nearly exploited enough makes this a forgettable game. If it was cheaper, maybe, but you can get much better games from Steam today for $7.50. No MMOs for me. It's too much of a timesink. I don't mind the monthly fees, but I like a variety in my games and MMOs often turn into full time jobs. However, the game looked interesting from what I followed before the release, and it brings a few new ideas to the World of Warcraft formula. But is it enough? I couldn't tell you. Again, point and clicks are not my genre most of the time, and I know next to nothing about these games. However, the premise for The Next Big Thing is seriously outlandish and I can definitely respect that. The general vibe I get is that these games are like the B version of Telltale, so you might find something neat here if you've already crushed the Sam and Max series from above. It's a top down coop shooter. At first I was all excited because I confused it with Awesomenauts. Awesomenauts looks awesome, but it is unreleased. This game looks like a game, but it is released. I literally couldn't tell you a single other thing about it if I tried. Well, there's a free Christmas DLC pack. But that's all I got. Don't expect lightning twice. Check your inventory to unlock this. Easy as that. Unfortunately, my inventory is broken and missing now. I'd really like it back soon. Beat Hallway with only wall arrows. Hallway is a very easy and linear map, but you need to beat it at least once to unlock the Arrow Wall, and then replay it. The upgrade for the wall trap won't help at all, as it just makes the range longer. If you bought the DLC, the vampire gloves will make this challenge so easy. Actually, it's already ridiculously easy. I recorded a video, but posting it would be insulting your intelligence. Fill the walls with arrows, and then do a bunch of headshots. Nothing to it at all. I don't have the rest of the games so I can't write my own guide, but I gathered up some helpful Steam threads. Apparently this achievement is bugged for a lot of users. Nobody can figure out why. A shame really. Here's one of the threads related to it. Here's a good little guide with the switch locations. It's fairly easy to do (just play the second third and fourth missions and collect the packages) but Steam user Brokenie posted a nice little cheatsy way to speed things up. This game also is quite cool, but I played it for a while on my friend's iPad so I don't really think I need it on PC. I'd still recommend giving the demo a spin though. And that wraps up today. Come on back tomorrow for more summary and possibly a video. What did you guys pick up today? Good stuff, looking forward to seeing your next Steam sale posts. I'm especially fond of the idea of you sharing your takes on each of the daily deal games. Personally, I thought about getting Metro 2033 but I'm not really the kind of gamer who likes tons of freedom, tasks, and that sort so decided against it. As for the Pendulo pack, they managed to make some fun 2000s era point n' click games when the genre was all but put out to pasture (before Telltale swooped in to reinvigorate it anyway). I love 'em for it! Thanks! I figure that you can see a list of the games being offered in lots of places (including Steam itself), so I should try something different. I've played most of the games I own for at least a little while, so I could use that to try to either give someone that last little push you need to buy something or talk them down from a purchase they don't really need. I figured that might be kind of more useful then a straightforward post, but it's also more time consuming. But at least it's not too difficult to pull off, and I'm working on getting the next posts out faster.